f. Shared Information – any personal information obtained by Brookmeade Hardware & Supply is not sold or disclosed, except as described herein. The following are circumstances where information disclosure may be mandatory: (1) if required by law or a legal proceeding; (2) if requested by law enforcement authorities or government officials; or (3) if disclosure is necessary or appropriate to prevent physical or financial harm or in connection with actual or suspected illegal activity. 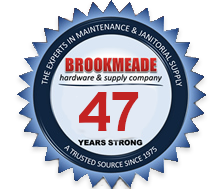 The right to transfer any information in the event of a change of ownership of Brookmeade Hardware & Supply is reserved. In the event of this occurrence, direction will be given to the transferee to use the personal information in a manner consistent with this Privacy Statement. g. Links to Other Sites – links to other external sites are provided for information and convenience. These sites may contain their own privacy statements and policies. It is recommended that these statements are viewed independent of Brookmeade Hardware & Supply website and Privacy Statement. k. Contact Us – should any questions or comments regarding the Privacy Statement arise, please contact us by calling (800) 251-1142.